Replacement light stand mounting block assembly as supplied with Einstein E640 and AlienBees B400, B800, B1600 and ABR800 flash units. 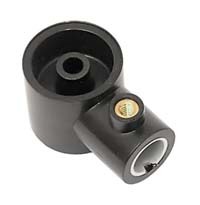 Fits onto light stand mounting studs up to 5/8" diameter. Note that the replacement assembly is not supplied with lock knobs or washers, as in most cases the original hardware can be reused.